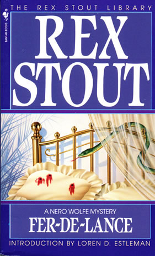 The first book in Rex Stout's copious Nero Wolfe mysteries. Published in 1934, it appears around the same time when hardboiled American detective fiction was appearing as a sub-genre, and it actually is an interesting coupling - combining the prototypical American tough guy with the "gentlemen detectives" which were the British mainstay at the time. Nero Wolfe, corpulent and cerebral, directs the investigation sequestered in his Manhattan brownstone. Archie Goodwin, the narrator, is his American leg-man, a tethered version of his darker American counterparts. Where many of the British detective fiction in this area is confined, here we bounce from the closed world of Wolfe's brownstone to the car-focused movements of Goodwin. It is a formula that works, with the dynamic established in this first book virtually unaltered for the remaining 30+ novels in the series. The writing is the real hero here: inventive and colloquial, evocative and playful. It never tries to be more than entertaining, exuding charm but forsaking depth. A major problem for me is that Wolfe is an infallible genius and all the detection is done up front, leaving the bulk of the novel to drive verdicts to conclusions -- largely by bullying. Additionally, as an enthusiast of character, there is a lot missing here. While our principal cast have dimension, those inhabiting the mystery around them (including the victims) are paper thin, or worse. I started with the first book, but next I will try one of the best-loved episodes next before passing judgement. Enjoyable sun-time reading, certainly.